The atoms of most elements, except for a few noble gases, can combine to form molecules. The atoms within these molecules are held together by strong attractive forces called chemical bonds, which are formed via the interaction of the valence electrons of the combining atoms. The chemical and physical properties of the resulting compound are usually very different from those of the constituent elements. For example, elemental sodium, an alkali metal, is so reactive that it can actually produce fire when reacting with water because the reaction is highly exothermic. Diatomic chlorine gas is so toxic that it was used for chemical warfare during World War I. However, when sodium and chlorine react, the biologically important compound NaCl (table salt) is produced. How do atoms join together to form compounds? In the example above, how do the sodium and the chlorine atoms form sodium chloride? For many molecules, the constituent atoms bond according to the octet rule, which states that an atom tends to bond with other atoms so that it has eight electrons in its outermost shell, thereby forming a stable electron configuration similar to that of the noble gases. An example of an octet configuration is shown for the noble gas argon (Ar) in Figure 3.1. Figure 3.1. 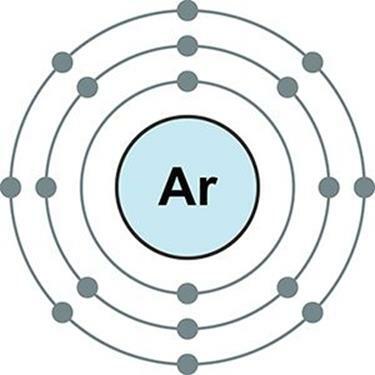 Electron Configuration of Argon As a noble gas, argon has a complete octet in its valence shell. However, this is more of a “rule of thumb,” because there are more elements that can be exceptions to the rule than those that follow the rule. These “exceptional” elements include hydrogen, which can only have two valence electrons (achieving the configuration of helium); lithium and beryllium, which bond to attain two and four valence electrons, respectively; boron, which bonds to attain six valence electrons; and all elements in period 3 and greater, which can expand the valence shell to include more than eight electrons by incorporating d-orbitals. For example, in certain compounds, chlorine can form seven covalent bonds, thereby holding 14 electrons in its valence shell. · Incomplete octet: These elements are stable with fewer than eight electrons in their valence shell and include hydrogen (stable with 2 electrons), helium (2), lithium (2), beryllium (4), and boron (6). · Expanded octet: Any element in period 3 and greater can hold more than eight electrons, including phosphorus (10), sulfur (12), chlorine (14), and many others. · Odd numbers of electrons: Any molecule with an odd number of valence electrons cannot distribute those electrons to give eight to each atom; for example, nitric oxide (NO) has eleven valence electrons. Another way to remember the exceptions is to remember the common elements that almost always abide by the octet rule: carbon, nitrogen, oxygen, fluorine, sodium, and magnesium. Note that nonmetals gain electrons and metals lose electrons to achieve their respective complete octets. The octet rule is the desire of all atoms to achieve noble gas configuration. However, keep in mind that there are many exceptions to this rule. We classify chemical bonds into two distinct types: ionic and covalent. In ionic bonding, one or more electrons from an atom with a low ionization energy, typically a metal, are transferred to an atom with a high electron affinity, typically a nonmetal. An illustration of such a process is shown for our initial example, sodium chloride, in Figure 3.2. Figure 3.2. Formation of an Ionic Bond Sodium (Na) has a low ionization energy, easily releasing an electron; chlorine (Cl) has a high electron affinity, easily absorbing that electron into its valence shell. In this example, both atoms achieve an octet formation. The resulting electrostatic attraction between opposite charges is what holds the ions together. This is the nature of the bond in sodium chloride, where the positively charged sodium cation is electrostatically attracted to the negatively charged chloride anion. It is important to note that this type of electrostatic attraction creates lattice structures consisting of repeating rows of cations and anions, rather than individual molecular bonds, as shown in Figure 3.3. Figure 3.3. 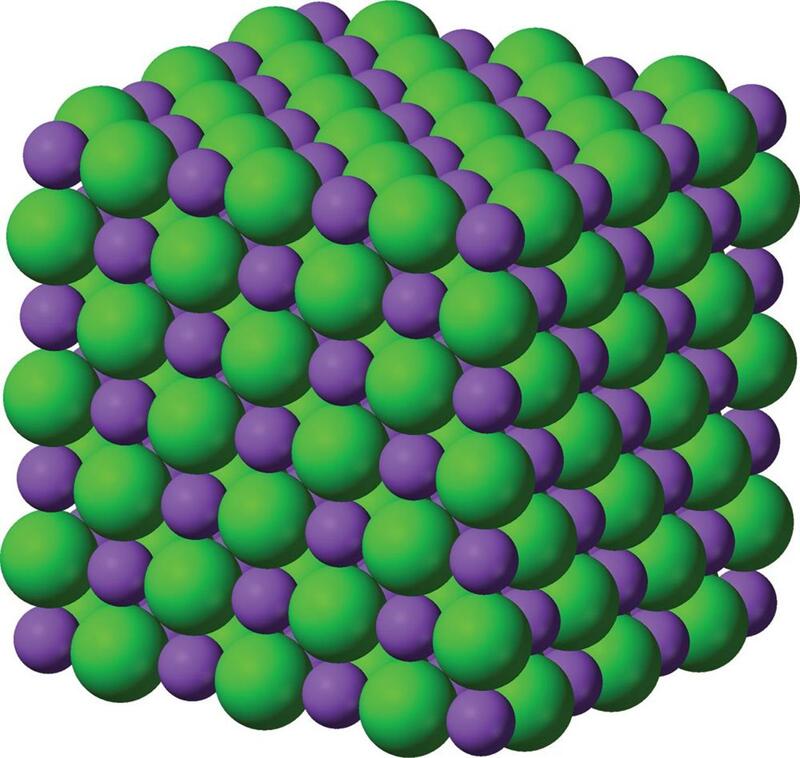 Crystal Lattice Structure of Sodium Chloride Sodium = purple; chloride = green. In covalent bonding, an electron pair is shared between two atoms, typically nonmetals, that have relatively similar values of electronegativity. The degree to which the pair of electrons is shared equally or unequally between the two atoms determines the degree of polarity in the covalent bond. For example, if the electron pair is shared equally, the covalent bond is nonpolar; and if the pair is shared unequally, the bond is polar. If both of the shared electrons are contributed by only one of the two atoms, the bond is called coordinate covalent. Electronegativity, discussed in Chapter 2 of MCAT General Chemistry Review, is a property that addresses how an individual atom acts within a bond and will help us understand the formation of molecules from atoms with different electronegativities. An example of nonpolar covalent bonding is shown for diatomic fluorine in Figure 3.4. Each atom has seven electrons in its valence shell, and by sharing one of these electrons from each atom, they can each form an octet. Unlike ionic crystal lattices, covalent compounds consist of individually bonded molecules. Figure 3.4. Formation of a Covalent Bond Fluorine (F) has seven valence electrons; by sharing one electron from each atom, both fluorine atoms achieve an octet formation. 3. Which periodic trend determines whether a covalent bond is polar or nonpolar?